Shi, S. and Carattino, M. D. (2017). Expression and Analysis of Flow-regulated Ion Channels in Xenopus Oocytes. Bio-protocol 7(8): e2224. DOI: 10.21769/BioProtoc.2224. Shi, S., Luke, C. J., Miedel, M. T., Silverman, G. A. and Kleyman, T. R. (2016). Activation of the Caenorhabditis elegans degenerin channel by shear stress requires the MEC-10 subunit. J Biol Chem 291(27): 14012-14022. Mechanically-gated ion channels play key roles in mechanotransduction, a process that translates physical forces into biological signals. Epithelial and endothelial cells are exposed to laminar shear stress (LSS), a tangential force exerted by flowing fluids against the wall of vessels and epithelia. The protocol outlined herein has been used to examine the response of ion channels expressed in Xenopus oocytes to LSS (Hoger et al., 2002; Carattino et al., 2004; Shi et al., 2006). The Xenopus oocyte is a reliable system that allows for the expression and chemical modification of ion channels and regulatory proteins (George et al., 1989; Palmer et al., 1990; Sheng et al., 2001; Carattino et al., 2003). Therefore, this technique is suitable for studying the molecular mechanisms that allow flow-activated channels to respond to LSS. Epithelial cells that line the urinary tract and endothelial cells that line blood vessels are subjected to mechanical forces elicited by moving fluids. These forces are, laminar shear stress (LSS), a frictional force tangential to the wall of the tubular structures, and circumferential stretch, which is perpendicular to the direction of flow. Compelling evidence indicates that LSS is the main determinant for the physiological responses observed in response to flow changes in tubular structures of the kidney and blood vessels (Satlin et al., 2001; Liu et al., 2003; Weinbaum et al., 2010). In these settings, ion channels have an important role transmitting fluid shear stress into biological signals (Ranade et al., 2015). For instance, in the distal nephron of the kidney the rates of Na+ reabsorption and K+ secretion are positively modulated by luminal fluid flow. In this segment of the nephron, high tubular flow rates enhance the activity of the epithelial sodium channel (ENaC) (Satlin et al., 2001 and 2006; Morimoto et al., 2006). In the face of high luminal flow rates, the apical entry of Na+ mediated by ENaC and its electrogenic basolateral extrusion create an electrochemical gradient that favors the passive diffusion of cellular K+ into the luminal fluid through maxi-K channels (Woda et al., 2001; Satlin et al., 2006). Likewise, in the vasculature, where fluid shear stress is essential for normal physiological responses, ion channels have been proposed as mechanosensors that mediate endothelial flow signaling (Davies, 1995; Hoger et al., 2002; Wang et al., 2009; Guo et al., 2016). The technique described in this protocol has been used to examine basic aspects of the regulation of ENaC by LSS as well as to gain understanding of the molecular mechanisms that allow this channel to respond to fluid flow (Carattino et al., 2004; 2005 and 2007; Morimoto et al., 2006). With this technique, we were able to characterize basic features of the response of ENaC to LSS, such as time-course of activation, strain dependence, temperature dependence, and voltage dependence (Carattino et al., 2004 and 2007). In addition, using ENaC mutant subunits that assemble to form channels that are either constitutively open (βS518K) or that can be locked in an open state by chemical modification (αS580C), we showed that fluid flow increases ENaC activity by changing the open probability of the channel (Carattino et al., 2004). This finding was later confirmed using single channel analysis (Althaus et al., 2007). Moreover, by combining the technique described herein and site-directed mutagenesis we were able to identify key structural elements in ENaC required for a response to LSS (Carattino et al., 2004 and 2005; Abi-Antoun et al., 2011; Shi et al., 2011; 2012a; 2012b and 2013). Recently, we employed this technique to examine the regulation of MEC-4 and MEC-10 by LSS. These channel forming subunits are members of the ENaC/degenerin family expressed in C. elegans that are required for gentle touch in worms (Driscoll and Chalfie, 1991; Shi et al., 2016). Other investigators have employed the technique describe here to study the response of K+ channels expressed in the vasculature to LSS (Hoger et al., 2002; Fronius et al., 2010). In summary, the technique described in this protocol is suitable to examine the molecular mechanisms by which fluid flow regulates the function of epithelial and endothelial ion channels. Note: The product “ 30530 ” has been discontinued. Anesthetize frogs in a 2-L beaker with anesthetic solution containing 0.15 % (w/v) tricaine methane sulfonate (MS-222) buffered with 0.2 % (w/v) NaHCO3 at room temperature. Frogs are immersed in the anesthetic solution (1 L) for at least 30 min or until lack of response to toe pinch (Figure 1A). Harvest ovaries through a lateral incision in the lower abdominal area. Avoid cutting the abdominal vein that runs through the center of the abdominal region, as it will result in unnecessary bleeding (see Figures 1B and 1C). Place harvested ovaries in a Petri dish containing ~20 ml MBS and incubate at 18 °C in B.O.D. incubator until further use. Euthanize the frog by immersion in the anesthetic solution for 1 h, followed by a thoracotomy and heart removal. Figure 1. Surgical removal of oocytes. A. Anesthesia depth is evaluated by pinching the toe with a pair of forceps. Surgical procedures are conducted when no withdrawal response to pinch is observed. B and C. Ovaries are harvested through a lateral incision in the lower abdominal area (B) using fine forceps (C). Prepare a collagenase stock (7x) solution by dissolving 21 mg of collagenase type IV and 50 mg of soybean trypsin inhibitor in 2 ml of Ca2+-free SOS. Gently dissociate ovarian lobes in small pieces (0.5-1 cm diameter) with a pair of Dumont size 4 forceps in a Petri dish containing MBS. Transfer ovary fragments to a 50 ml conical tube and wash 3 times with 50 ml of Ca2+-free SOS. To wash the fragments, leave the tube in vertical position until the fragments sink to the bottom, then gently rotate the tube to dump the solution covering the pieces of tissue. Transfer ~7 ml of washed ovary fragments to a 15 ml conical tube containing 3 ml of Ca2+-free SOS. Add 2 ml of collagenase stock solution to the 15 ml conical tube containing the ovary fragments, fill the tube with Ca2+-free SOS to 14 ml and close the tube. Rotate the tubes containing ovary pieces in the Nutator Mixer at 12 rpm for one hour at room temperature. After 1 h of incubation, use a plastic transfer pipette with a cut tip (~5 mm diameter) to transfer an aliquot of the digest to a Petri dish. Oocyte should be submerged in the solution and not come in contact with air at any time. Visually inspect the oocyte under a stereomicroscope. The digestion with collagenase is completed when oocytes lack most of the extracellular connective tissues and vessels (see Figure 2C). If after 1 h incubation a significant amount of connective tissue and vessels are still visible, extend the incubation for 10 min more, or as required. Take into consideration that excess of collagenase digestion can affect the viability of the oocytes. To remove remaining pieces of connective tissue that might still attached to the oocytes after the collagenase digestion, transfer the oocytes (and solution) from the 15 ml conical tube to a 50 ml conical tube. Leave the tube in vertical position until the oocytes sink to the bottom, then gently rotate the tube and dump the solution covering the oocytes. Fill the tube with 30 ml of hypotonic solution, mix gently and dump the solution covering the oocytes. Repeat the last step twice. Incubate the oocytes with 30 ml of hypotonic solution for 15 min at room temperature on a bench (without agitation). After the incubation, wash the oocytes three times with MBS and place them in a Petri dish containing MBS. Store the oocytes in the B.O.D. incubator at 18 °C for at least two hours before proceeding to sorting. Select oocyte stage V and VI with the oocytes transferring pipette (see Figure 2E). At these stages of development, oocytes normally have a well-defined belt separating the animal pole (dark) from the vegetal pole (light). Figure 2. 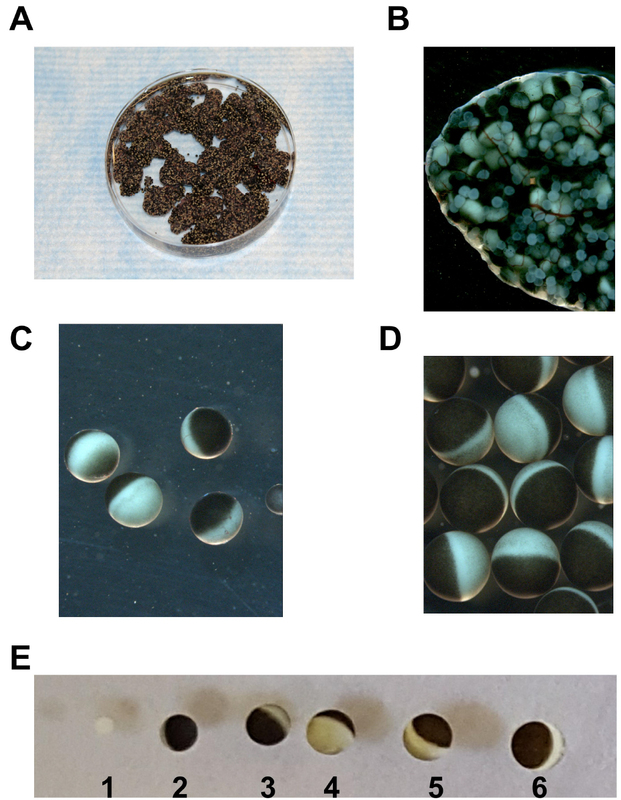 Isolation of Xenopus laevis oocytes. A. Macroscopic view of harvested ovaries; B. Close view of an ovary sac; C. Close view of oocytes after collagenase digestion. Note that some connective tissue and vessels still present in the surface of the oocytes. D. Close view of oocytes after treatment with the hypotonic solution; E. Close view of oocytes at development stages 1-6. Note that stage 5-6 oocytes have a diameter of approximately 1 mm. cRNA is produced with a commercial in vitro transcription kit following the supplier directions. We use mMessage mMachine transcription kits from Ambion. Use nuclease free water and nuclease-free tubes and tips to prepare and handle cRNA solutions. Pull injection needles from 3.5” glass capillaries using a single step protocol (one step, heater level 65.1). Cut the tip to a 30° angle with a razor blade. The diameter of the tip of the injection needles should be approximately 50 µm. Note: Injection needles with angled fine tips enable wound healing and increase oocytes survival. Set the injection volume at 50 nl and the injection speed at fast. Fill the injection pipette with mineral oil using a syringe with a 25 G needle. Plug the filled injection pipette in the microinjector and push the mineral oil out with the ‘empty’ bottom (Figure 3A). Figure 3. Oocytes injection workstation. A. Injection pipettes made of glass capillaries are used for injection of cRNAs encoding for ion channels and other proteins in Xenopus oocytes. Injection workstation components labeled as follows: 1. Stereo microscope with external light source; 2. Micromanipulator and magnetic holding device; 3. Nanoinjector; 4. Nanoinjector controller. B. Loading of injection needle with cRNA. The injection needle is filled with mineral oil. A drop of the solution containing the cRNA of interest is place in the center of a piece of Parafilm. cRNA solution is collect with the injection pipette using the ‘fill’ bottom in the nanoinjector controller. C. Close view of oocytes aligned in a Petri dish. To prevent rolling during injection, oocytes are placed in a Petri dish with a polypropylene mesh glued to the bottom. Place a square piece of Parafilm (~2 x 2 cm) in the field of view of the stereomicroscope (Figure 3B). Place a drop of the solution containing the cRNA of interest (5-6 µl) in the center of the Parafilm. Collect the cRNA solution with the injection pipette using the ‘fill’ bottom. Press the injection bottom several times to verify that the injection pipette is working properly. Fill the oocyte injection Petri dish with MBS. Transfer 20-40 oocytes from the incubation dish with a polished Pasteur pipet and arrange them in a line in the injection Petri dish (Figure 3C). Move the injection pipette close to the oocytes. Gently impale an oocyte in the center of the animal pole (dark side) and inject the cRNA by pressing the ‘inject’ bottom. Hold the injection pipette for 3-4 sec inside the oocyte. Retract the injection pipette and sequentially inject the next oocyte in the line. Collect the injected oocytes and place them in a 6-well tissue culture plate filled with MBS. Incubate the oocytes at 18 °C for at least 20 h. The incubation time required for expression depends on the ion channel being studied. Note: For expression of ENaC, 1-2 ng cRNA/subunit is routinely injected and 24-48 h of incubation are required. For other channels, such as C. elegans degenerin channels, 5-10 ng cRNA/subunit are injected and a longer incubation (> 4 days) is required for optimal expression. A software-controlled gravity-fed inflow perfusion system and vacuum-assisted outflow is utilized to perfuse the chamber used for electrophysiological recordings (Figure 4). 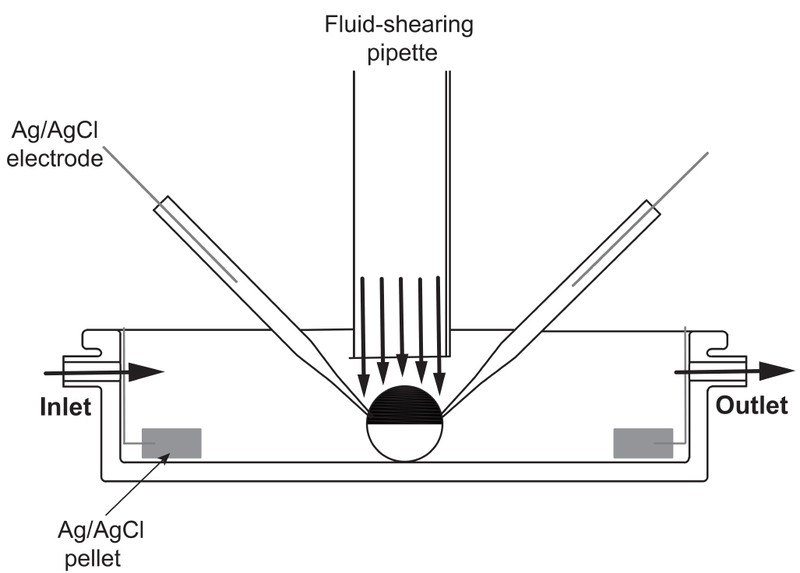 The apparatus employed to deliver the fluid-shearing flow consist of an L-shaped glass pipette with an inner diameter of 1.8 mm, which is connected to one channel of the perfusion system. The fluid-shearing pipette is made of a 1.8 inner diameter capillary glass. The capillary glass is bent to L-shape (~ 90° angle) with a Bunsen burner. The fluid-shearing pipette is mounted in a three-axis manual micromanipulator in front of the recording chamber (see Figure 5B). Figure 4. Schematic of the recording chamber and perfusion system used to study flow-regulated ion channels. A home-made (20-mm diameter and 6-mm deep) chamber is used to bath the oocytes. To apply laminar shear stress, a homemade vertical perfusion glass tube (1.8 mm internal diameter) is placed right above the oocytes. Fluid is delivered through the fluid-shearing pipette using a software-controlled gravity perfusion system. Figure 5. Two-electrode-voltage (TEV) clamp of Xenopus oocytes. View of the two-electrode voltage clamp rig. A. Components are labeled as follows: 1. GeneClamp 500B amplifier and Digidata 1550B; 2. VC-6 PTFE valve perfusion system; 3. Stereo microscope with external light source; 4. Dell OPTIPLEX desktop; 5. Left and right electrode holders, micromanipulators and magnetic holding devices; 6. Fluid-shearing pipette, micromanipulator and magnetic holding device; 7. Flow valve. B. Close view of the oocyte flow chamber and perfusion system. The rate of laminar shear stress (LSS) on the oocyte surface is estimated as the relation of the drag force (Fdrag) and the surface area of the oocyte, LSS = Fdrag/surface area of the oocyte. The magnitude of the Fdrag is determined according to Fdrag = 0.5 ρAω2Cd, where ρ represents the water density (1 g/cm3), A is the cross-sectional area of the sphere (πr2) (for Xenopus oocytes r = 0.05 cm), ω is the average free stream velocity (flow rate/cross sectional area of the perfusion pipette) and Cd is the drag coefficient (~1 for spheres with a Reynolds number within the 3-25 range). The Reynolds number is determined as, Re = θωD/λ, where θ is the fluid density, ω is the average free stream velocity, D is the sphere diameter and λ is the viscosity of the water. For example, a perfusion rate of 1.5 ml/min is needed to generate a shear stress of 0.12 dynes/cm2 with a fluid-shearing pipette with a diameter of 1.8 mm. Experiments are conducted at room temperature (20-25 °C) on a two-electrode voltage clamp rig as shown in Figure 5. Estimate required flow rate to achieve desired rate of LSS as indicated in step D2. Fill the perfusion syringes with TEV solution. Adjust the perfusion rate of the bath solution to ~3 ml/min. Adjust the flow of the fluid-shearing pipette to the desired rate with the flow valve. The flow rate is determined by gravimetry by collecting fluid for a minute in a pre-weighted tube. Alternatively, a flowmeter can be connected in line with the perfusion system to measure the flow rate. Pull recording pipettes from 4” glass capillaries (1.5 mm) using a two-step protocol with the micropipette puller (set heater level step 1 at 47.2 and step 2 at 62.1). Backfill glass pipettes with 3 M KCl and gently tap them to release air bubbles from the tips. 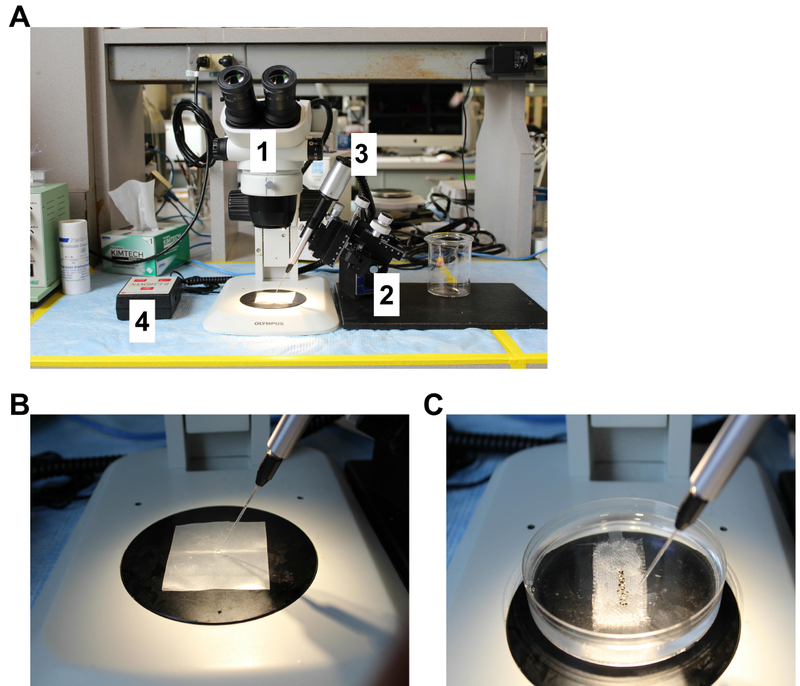 Transfer an injected oocyte to the center of the recording chamber (see Figure 5B). Mount the recording pipettes onto the left and right electrode holders. With the amplifier in the setup mode, carefully place the recording pipettes in the chamber to measure their resistance in the TEV solution. Note: The resistances of the pipettes should be between 0.2-2 mΩ. Pipettes with resistances < 0.1 mΩ are considered leaky and should be replaced. Adjust the offset of the recording electrodes to zero. 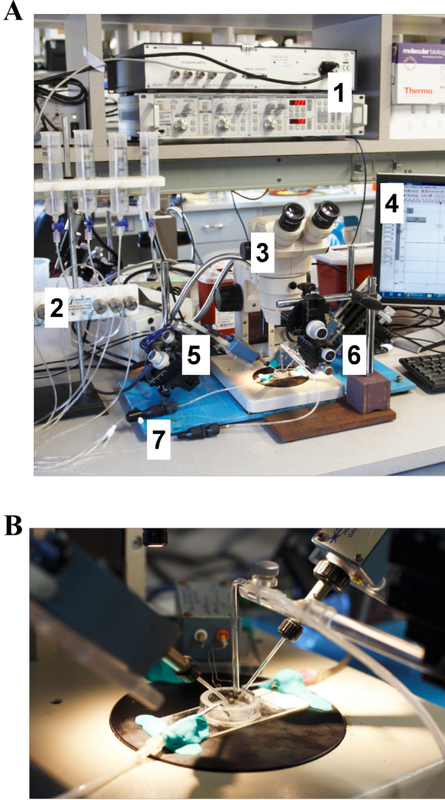 Move the recording electrodes close to the oocyte by altering the X-Y-Z knobs of the micromanipulator. Gently impale the oocyte with the recording electrodes using the Z knob. The fluid-shearing pipette should be visible with the stereo microscope. Using the stereo microscope, position the tip of the fluid-shearing pipette directly above the oocyte. Carefully move the fluid-shearing pipette down within 0.5-1.0 mm of top of the oocyte. Set the amplifier to voltage-clamp mode. For ENaC, currents are continuously recorded at a membrane potential at -60 mV. The perfusion system is controlled with external TTL signals using pClamp 10. During the recordings, the chamber is continuously perfused with TEV solution. Pulse of fluid are applied through the fluid-shearing pipette. Usually, we record currents with bath perfusion for the first 30 sec, we apply fluid shear stress for 60 sec or until the current plateaus, and then we perfuse the chamber with a TEV solution containing benzamil (5 μM) for 30 sec to determine the leak current. To examine the voltage-dependence of the flow-activated component, whole cell currents are measured using a series of voltage steps (e.g., 500 msec) from -140 to 60 mV under basal conditions, in the presence of fluid shear stress and after perfusion with a channel inhibitor (see Carattino et al., 2006 for details). At the end of the experiment, move the fluid-shearing pipette to the initial position, remove the recording pipettes from the oocytes and discard the oocyte. Note: Benzamil or other channel blockers used during the experiments must be washed off by flushing TEV solution in the bath and vertical tube for at least 3 min. For ENaC and MEC channels, the magnitude of response to LSS (LSS response) is defined as the ratio of the benzamil-sensitive component of the current in the presence of LSS (I¬+LSS) and the benzamil-sensitive component of the current under basal conditions (I¬-LSS) (see Figure 6). I¬-LSS is determined by subtracting the benzamil-insensitive current (Ibenz), determined in the presence of benzamil in the bath, to the current measured just prior to the initiation of LSS (Ibasal). I¬+LSS is calculated by subtracting the benzamil-insensitive current to the peak current evoked by LSS (Iflow). Figure 6. Flow-mediated activation of C. elegans MEC-4/MEC-10 channels in Xenopus oocytes. Oocytes were injected with cRNAs encoding for MEC-4/MEC-10. LSS (0.12 dynes/cm2) was applied thorough the fluid-shearing pipette with continuous bath perfusion. The membrane potential was clamped at -60 mV. Vertical flow of 1.5 ml/min (grey bar) was initiated at t = 30 sec. At the end of experiment, TEV solution containing benzamil (5 μM) was perfused through the bath (black bar). Three measurements were made: the baseline current (Ibasal), LSS-stimulated current (Iflow) and benzamil-insensitive current (Ibenz). The magnitude of the response of MEC-4/MEC-10 channels to LSS (LSS response) was estimated as I¬+LSS/I¬-LSS. a and c are constants determined by curve fitting. There is an inherent variability in the expression of proteins in Xenopus oocytes, which results from seasonal variation in the quality of the oocytes, extent of collagenase treatment and the cRNA injection procedure. To account for the variability in the expression, experiments are repeated with several batches of oocytes harvested from different frogs. This work was supported by NIH grants R01DK084060 (M.D.C.), K01DK103834 (S.S.), and by the Cellular Physiology and Kidney Imaging Cores of the Pittsburgh Center for Kidney Research (P30-DK079307). Abi-Antoun, T., Shi, S., Tolino, L. A., Kleyman, T. R. and Carattino, M. D. (2011). Second transmembrane domain modulates epithelial sodium channel gating in response to shear stress. Am J Physiol Renal Physiol 300(5): F1089-1095. Althaus, M., Bogdan, R., Clauss, W. G. and Fronius, M. (2007). Mechano-sensitivity of epithelial sodium channels (ENaCs): laminar shear stress increases ion channel open probability. FASEB J 21(10): 2389-2399. Carattino, M. D., Hill, W. G. and Kleyman, T. R. (2003). Arachidonic acid regulates surface expression of epithelial sodium channels. J Biol Chem 278(38): 36202-36213. Carattino, M. D., Liu, W., Hill, W. G., Satlin, L. M. and Kleyman, T. R. (2007). Lack of a role of membrane-protein interactions in flow-dependent activation of ENaC. Am J Physiol Renal Physiol 293(1): F316-324. Carattino, M. D., Sheng, S. and Kleyman, T. R. (2004). Epithelial Na+ channels are activated by laminar shear stress. J Biol Chem 279(6): 4120-4126. Carattino, M. D., Sheng, S. and Kleyman, T. R. (2005). Mutations in the pore region modify epithelial sodium channel gating by shear stress. J Biol Chem 280: 4393-4401. Davies, P. F. (1995). Flow-mediated endothelial mechanotransduction. Physiol Rev 75(3): 519-560. Driscoll, M. and Chalfie, M. (1991). The mec-4 gene is a member of a family of Caenorhabditis elegans genes that can mutate to induce neuronal degeneration. Nature 349: 588-593. Fronius, M., Bogdan, R., Althaus, M., Morty, R. E. and Clauss, W. G. (2010). Epithelial Na+ channels derived from human lung are activated by shear force. Respir Physiol Neurobiol 170(1): 113-119. George, A. L., Jr., Staub, O., Geering, K., Rossier, B. C., Kleyman, T. R. and Kraehenbuhl, J. P. (1989). Functional expression of the amiloride-sensitive sodium channel in Xenopus oocytes. Proc Natl Acad Sci U S A 86(18): 7295-7298. Guo, D., Liang, S., Wang, S., Tang, C., Yao, B., Wan, W., Zhang, H., Jiang, H., Ahmed, A., Zhang, Z. and Gu, Y. (2016). Role of epithelial Na+ channels in endothelial function. J Cell Sci 129: 290-297. Hoger, J. H., Ilyin, V. I., Forsyth, S. and Hoger, A. (2002). Shear stress regulates the endothelial Kir2.1 ion channel. Proc Natl Acad Sci U S A 99(11): 7780-7785. Liu, W., Xu, S., Woda, C., Kim, P., Weinbaum, S. and Satlin, L. M. (2003). Effect of flow and stretch on the [Ca2+]i response of principal and intercalated cells in cortical collecting duct. Am J Physiol Renal Physiol 285(5): F998-F1012. Morimoto, T., Liu, W., Woda, C., Carattino, M. D., Wei, Y., Hughey, R. P., Apodaca, G., Satlin, L. M. and Kleyman, T. R. (2006). Mechanism underlying flow stimulation of sodium absorption in the mammalian collecting duct. Am J Physiol Renal Physiol 291(3): F663-669. Palmer, L. G., Corthesy-Theulaz, I., Gaeggeler, H. P., Kraehenbuhl, J. P. and Rossier, B. (1990). Expression of epithelial Na channels in Xenopus oocytes. J Gen Physiol 96(1): 23-46. Ranade, S. S., Syeda, R. and Patapoutian, A. (2015). Mechanically activated ion channels. Neuron 87(6): 1162-1179. Satlin, L. M., Carattino, M. D., Liu, W. and Kleyman, T. R. (2006). Regulation of cation transport in the distal nephron by mechanical forces. Am J Physiol Renal Physiol 291(5): F923-931. Satlin, L. M., Sheng, S., Woda, C. B. and Kleyman, T. R. (2001). Epithelial Na+ channels are regulated by flow. Am J Physiol Renal Physiol 280(6): F1010-1018. Sheng, S., Li, J., McNulty, K. A., Kieber-Emmons, T. and Kleyman, T. R. (2001). Epithelial sodium channel pore region. Structure and role in gating. J Biol Chem 276(2): 1326-1334. Shi, S., Blobner, B. M., Kashlan, O. B. and Kleyman, T. R. (2012a). Extracellular finger domain modulates the response of the epithelial sodium channel to shear stress. J Biol Chem 287(19): 15439-15444. Shi, S., Carattino, M. D., Hughey, R. P. and Kleyman, T. R. (2013). ENaC regulation by proteases and shear stress. Curr Mol Pharmacol 6(1): 28-34. Shi, S., Carattino, M. D. and Kleyman, T. R. (2012b). Role of the wrist domain in the response of the epithelial sodium channel to external stimuli. J Biol Chem 287(53): 44027-44035. Shi, S., Ghosh, D. D., Okumura, S., Carattino, M. D., Kashlan, O. B., Sheng, S. and Kleyman, T. R. (2011). 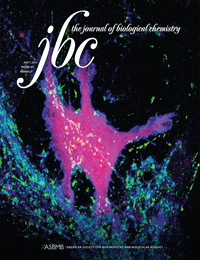 Base of the thumb domain modulates epithelial sodium channel gating. J Biol Chem 286(17): 14753-14761. Wang, S., Meng, F., Mohan, S., Champaneri, B. and Gu, Y. (2009). Functional ENaC channels expressed in endothelial cells: a new candidate for mediating shear force. Microcirculation 16(3): 276-287. Weinbaum, S., Duan, Y., Satlin, L. M., Wang, T. and Weinstein, A. M. (2010). Mechanotransduction in the renal tubule. Am J Physiol Renal Physiol 299(6): F1220-1236. Woda, C. B., Bragin, A., Kleyman, T. R. and Satlin, L. M. (2001). Flow-dependent K+ secretion in the cortical collecting duct is mediated by a maxi-K channel. Am J Physiol Renal Physiol 280(5): F786-793.